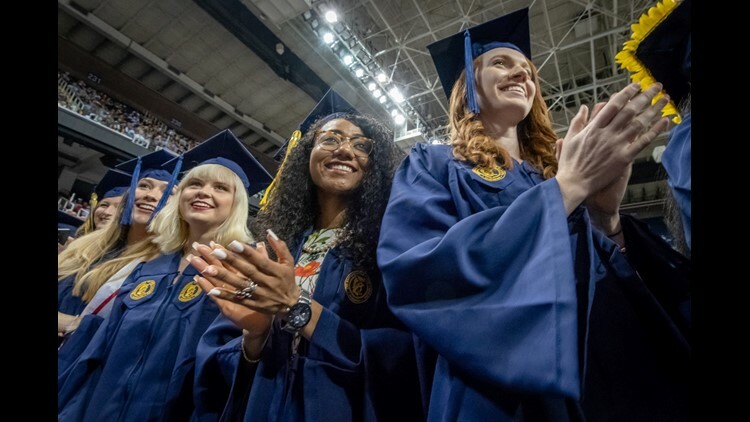 The university awarded nearly 2,700 degrees at today's commencement ceremony. 100 of these degrees will be awarded to international students. Triad native, Olympian Joey Cheek gave the commencement address. A Greensboro native, Cheek won gold and silver medals at the Olympic Games in Torino, Italy, in 2006. He won his first ever international medal at the 2002 Olympics in Salt Lake City, a bronze in the 1,000 meters, and has accumulated more than 25 World Cup and World Championship medals throughout the course of his career. Cheek was named to TIME’s 100 Most Influential People, the U.S. Speed Skating Hall of Fame and the International Sports Humanitarians Hall of Fame. He even got to be on the Wheaties box. Later, the gold medalist in speed skating took home an award of his own! He was inducted into the North Carolina Sports Hall of Fame.